Ripton is a small mountain town with 587 residents overlooking Middlebury, Vermont. One of its most famous residents is the late Robert Frost, whose presence is still keenly felt today. Frost had a longstanding connection with Middlebury College and its Bread Loaf campus, having summered and taught in Ripton beginning in the early 1920s. After his wife’s death, he spent the last twenty-five years of his life in Ripton, teaching at the campus and working his farm. Elemental in creating the Bread Loaf Writers’ Conference, an extension of Middlebury College’s English program, Frost settled nearby on a hilltop farm. The Homer Noble Farm, now a museum, is an idyllic site with views of Mount Moosamaloo. On the property, a rustic cabin sits as a shrine to its famous occupant. Frost worked and wrote in this log cabin, connecting with rural Vermont and celebrating its beauty. Middlebury College owns and maintains the property, offering faculty housing and tours to school groups and visiting scholars. Touring the house, lands and woods where Frost lived and worked gives an intimate perspective. The college also presents an online exhibit which takes you into the personal life and observations of the man, told through candid photographs, journal notes of those who knew him, and audio texts of lectures and conversations. In 1953, the state legislature named a Green Mountain peak “Robert Frost Mountain” in the northwest corner of town, establishing him literally as part of the landscape. 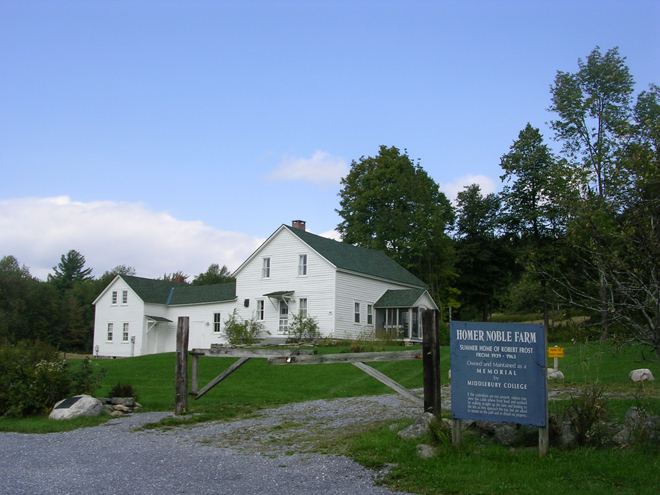 Across the road from Homer Noble Farm is the Robert Frost Interpretive Trail, a one mile path designed for enjoyment and contemplation in the Green Mountain National Forest. 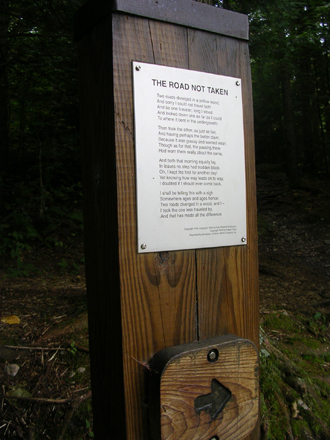 Frost’s poems are posted along the easily traversable trail, passing through woods and crossing the South Branch of the Middlebury River. Visitors may sit on benches to absorb their surroundings while considering Frost’s lines. 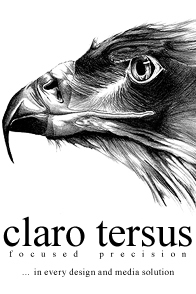 One may find Two Roads Diverged in a Wood (spoken here by the man himself) and will choose one path, with the unique knowledge that the other can be taken as well on the looped system. The US Forest Service oversees the trail and plans to repair the minor damage caused by Hurricane Irene on August 28, 2011, once again making this treasure accessible to all. Deemed the “first citizen of the Town of Ripton,” Frost left his legacy for all cherish and enjoy. Groups such as Frost Friends offer personal stories and photographs of the poet in Ripton and South Shaftsbury. Also included on their website is a reprint of the 1955 Yankee Magazine article A Walk with Robert Frost by his friend, Reginald L. Cook. Today, Vermont’s children are taught Frost’s poetry as part of the school curriculum, including those attending Ripton Elementary School. 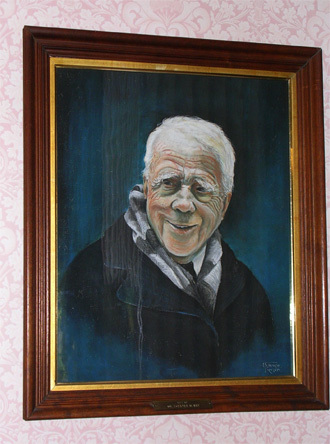 Down the mountain from the school at the Middlebury Inn, Frost gazes down from his portrait above the front desk. When you visit Ripton take some time to discover, or reacquaint yourself with, Robert Frost. It’s time well spent.